WHAT DO COUNCILLORS DO ? - Councillors are the champions of their community and give residents -and others-a voice on the decisions the council makes. Becoming a councillor will allow you to make a real difference in your community by engaging with residents, local groups and businesses to find out their needs, making decisions on which services and projects the council should take forward - and getting involved locally to ensure the services are meeting your community’s need. HOW MUCH TIME WOULD I NEED ? - The National Association of Local Councils (NALC) Local Councillor Census Survey found that councillors put aside, on average, three hours a week for council work. This often includes; attending meetings, ~ reading documents and emails, ~engaging with residents and representing the council on other bodies. However, it can be less. Ewhurst Parish Councillors meet at least 10 times a year, normally on a Thursday evening. CAN I STAND? - Subject to the rules on disqualification you can stand if you are a British Citizen ( or a citizen of the Commonwealth, or the European Union ) are over 18 and a registered elector.- in addition, you will be qualified to stand if, during the 12 months before your nomination of the day of your election, you: * Resided in the Parish ( or within 3 miles of the Parish boundary or * Occupied ( as owner or tenant) any land or premises with the Parish or * Had your only or principal place of (paid/unpaid) work in the Parish..
STAPLECROSS SOCIAL CLUB: Last gentle reminder of the CLOSURE of the Staplecross Social Club over this weekend of Saturday & Sunday 9th & 10th of FEBRUARY. This will be due to the refurbishment works required in the club. Apologies are extended to anyone who may be inconvenienced by this and I hasten to add that this popular little social club will re-open for business on the Monday evening 11th February 2019. Please pop in, see what’s new & what’s being planned for 2019. ROTHER RAMBLERS: We have a treat in store for all those stalwart walkers who enjoy nothing better that a meander around our beautiful countryside. This week 2 walks are organised for our enjoyment. 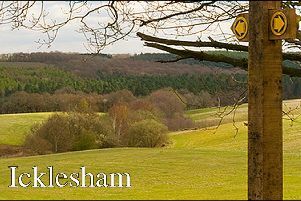 Walk No: 1 is an 8.5 mile circular stroll of Hailsham and Upper Dicker and is planned for Saturday February 9th. The meeting point is at the South Road car park (Cuckoo Trail) in Hailsham. OS. EXP123. TQ589093. (satnav BN27 2BG) at the normal time of 10.00am.This is understood to be a mainly flat walk, starting in the town, - then finding some green lanes, spaces and fields. A picnic lunch is also suggested. Perry is to be your ‘walk leader’ for this amble and you may contact him on: Mobile 07969~025507 for further details. Walk No: 2. is a Morning walk of 8.5 circular miles wandering south of Burwash and is planned for Wednesday February 13th.The meeting place will be the car park next to The Bear Inn, Burwash. OS.EXP.136. TQ673246. (satnav TN10 7ET again at 10.00 am. The walk notes state to use the 9 hour spaces in car park, or park on street if possible. For possible car sharing please contact Phil beforehand. Again a picnic lunch is suggested. Phil is to be your ‘walk leader; for today, and you may contact him on: 07887~635681 for more information. EWHURST PARISH COUNCIL: Members of Ewhurst Parish Council would like to invite all residents of our Parish to come along to the regular monthly meeting which this month will be on Thursday February 14th. and will be held at The Herdman Pavilion, Ewhurst Green at 7.30pm..This like all council meetings, is open to the public, so please come along and have you say. Tell us about your concerns and talk to us about what you want to happen - or not happen - within our community. Put your questions to all levels of local government as representatives from Rother District Council and East Sussex County Council will hopefully, also be in attendance. We are always working hard on your behalf so please come and tell us how we’re doing, how we can improve, and how we can make living within this parish a happier and better place for us all. STAPLECROSS LUNCHEON CLUB: Following the wonderful lunch held it seems some weeks ago. The members of this little social dining group are looking forward to enjoying another delicious meal conjured up by Wendy and her merry band of helpers. This very friendly and inexpensive dining group will be making their way to the Village Hall, in Staplecross on Wednesday February 20th at 12.30pm where this month they will enjoy Chicken & Ham Pie with all the trimmings followed by Apple Sponge pudding The charge for these delicious, well cooked, and varied monthly menu’s is still just £6:00 per person, which offers great value all round. If you would like to join us in this wonderful lunch then please contact either Sallie on 01580~830000 or Pauline on 01580~830570 to add your name to the table settings, or just for any further information. We’d love to welcome you to our friendly little dining group. EWHURST, STAPLECROSS & BODIAM GARDEN SOCIETY: Another great speaker is lined up for the members and their guests to enjoy when they attend the next meeting of the E.S. & B. Garden Society. The speaker is very well known in gardening circles with a host of ‘talk titles’ to her name Hannah Miles-Watson from “Hannah’s Garden Fam Flowers in Benenden, will be coming along to talk to us about ‘The Cutting Garden. This is such an interesting subject with a wide variety of flowers suggested- by sadly not many of us now have space in our plots just to grow flowers for cutting. This meeting will of course, take place in in Staplecross Village Hall (TN32 5QG) on Thursday February 21st at 7.30pm. New potential members are always welcome to all of our meetings, so please come along and enjoy the evening. CHURCH SERVICES: Church services for the parish of Ewhurst, will commence at St. James the Great, Ewhurst Green on Sunday February 10th. 4th Before Lent. at 9.30am. This service will include Holy Communion. (BCP) A ‘Morning Praise’ service at St. Mark’s church Northiam Road, Staplecross, will follow 11.15 am. This service will also include Holy Communion. (BCP) There will be NO SERVICE today at St. Giles church, Bodiam. If there is any church matter on which you feel you may need further assistance, especially Baptisms, Weddings and sadly, Funerals, then do please get in touch with the Priest - in - Charge, which is of course Canon Christopher Irvine on 01580~830925. Help in some way is always at hand and always so generously given, so do please contact him. PLEASE CONTACT ME: If you are arranging an event in the foreseeable future, --- whatever the nature of the event and however large or small, and you’d like some extra free coverage for it, - courtesy of the Observer Newspaper - then please get in touch. If it’s of interest to you, - it’s of interest to us. it’s never too early to send in any of the details and to tell us what you are planning. Many of you will be turning your thoughts to other events in the near future, as the long new and unblemished weeks of Spring begin to stretch before us. so please do contact me, as I’d love to hear from you and to help ‘spread the word’ on your behalf.